LOCAL group, ‘Friends of Shurnhold Fields’, has been given the go-ahead to start work on creating a new mini country park for Melksham. The group is appealing for donations of hand tools and for volunteers to take part in a ‘litter pick’ later this month. 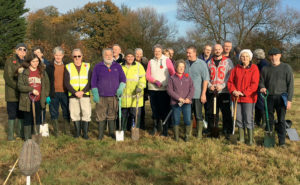 ‘Friends of Shurnhold Fields’ was formed last year to support the ongoing development and maintenence of the new mini country park on the site of the former George Ward School playing fields. Work began in November last year with the planting of 200 trees to commemorate the fallen soldiers of World War One from the Melksham area. But further work was put on hold until the completion of the legal transfer of ownership of the land from housing developers Persimmon to Melksham Without Parish Council, who will jointly manage the land with the town council. On behalf of ‘Friends of Shurnhold Fields’, Phil Mason said, “I can now report that the Shurnhold Fields have now passed ownership from Persimmon Homes to Melksham Without Parish Council, therefore the ‘Friends’ can now set to doing some work on the area. “To this end we will need to gather together some basic hand tools, we are looking for donations of any reasonable quality garden style tools for ground working, hedge cutting – for example bow saws, pruning saws, loppers or any other such items.